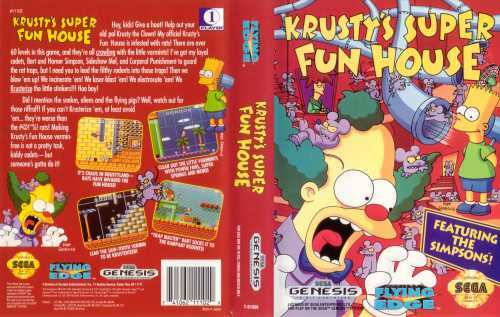 America's Number 1 video game family is back--this time with Krusty the Clown leading the way in a tough puzzle-and-action challenge. For help, Codes 1 and 2 together give you infinite lives, and Code 49 gives you infinite pies and superballs. Getting cocky? See how far you can get with Code 3, one life. Codes 17 thru 20 give you more time to complete bonus rooms, where you normally have about 15 seconds. 5 SMAILLIW Start the game with unlimited lives and all doors open. nod to Itchy and Scratchy for sheer mayhem. Poor. Very poor. The NES version is better! The MD version lacked in controls, and Moe and Grampa didn't look like their characters! 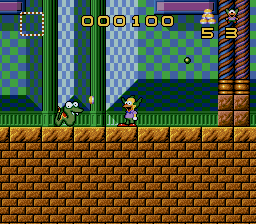 This and Sonic 2 were my first ever Genesis games. I traded Bart Vs. the Space Mutants the day the stores opened again. 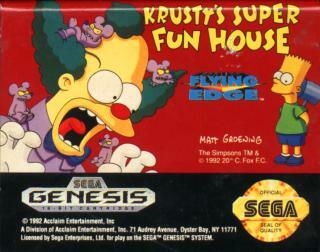 i remember playing this on my friends amiga 500 and it was something different for amiga games, it was a simpsons game and it had everything from the hit tv show in the game and the mega drive verson was just as good. 7/10 great game but can get a bit tricky and frustrating. Much like the NES version just jampacked with better sound and graphics. GET THOSE slimy aliens! Virtual Bart is a fun game, it's like taking many other mini-games and rolling them into one. A bit hard for it's genre. It's very good, I think BART VS. SPACE MUTANTS is the best game! i was hoping that someone might be able to tell me on which diffrent formats the bart .v. space mutants and on where i can buy it. my nes cannot be hooked to my tv so im hoping to get it for the pc. 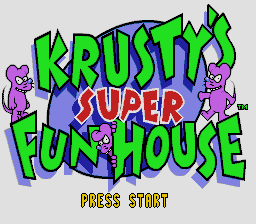 I Liked this game alot! Its not one game its a load of mini games all includeing Bart in differt time eras, differnt places, its a differnt kinda game. I loved the water slide level, baby level, and the school picture level!